What I DIDN’T Expect The First Year . . . or the Second & Third Year! My boys are now 3 months and 3 years old. I find myself obsessed about the same thing with both of them, something I didn’t expect to be so obsessed with, something that I try and ensure that my boys get enough of each day. Can anyone guess? The “word on the street” (as I steal a phrase from Sesame Street) is SLEEP!!! As most first time preggo mommies do, I devoured many a book when I was pregnant with #1 but did not even think to look into “sleep books.” Isn’t that what babies do – eat, SLEEP, poop? It’s simple – feed baby then baby sleeps peacefully in the super fancy crib in the super cool nursery you designed! For many, this is how the story goes and the family travels happily down the proverbial sleep road. In our case, it was different. When baby #1 was about a month old and our lives had settled a bit, I was wondering why sleep was so tough for him. I was obsessed with Googling (that’s got to be a word now) everything about infant sleep. I was bonding (and continue to) with other new moms over this exact same topic at play dates, play gyms, and parks. 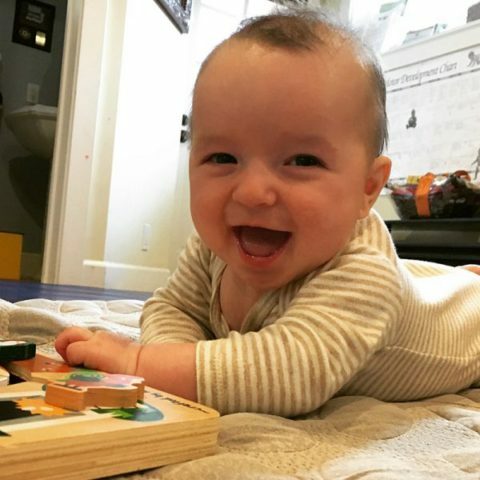 Early on, I relied on Dr. Harvey Karp’s “Happiest Baby on the Block” book and the 5 S’s. As baby #1 got older, sleep (getting him to do it for a long period of time by himself) continued to be challenging. By the time my first was 10 months old, I had read about sleep everywhere, gotten all of the advice I could stomach, and finally hired an online sleep consultant. The sleep consultant was to advise me with MY child’s/family’s specific needs and to keep me accountable to follow through with changes that I knew would be extremely hard. Since then, we have had waves of good and bad sleep – making it through sleep regressions, teething, and now, working through being scared of the dark. Best advice: sleep begets sleep. No matter how many times I try and trick the “system” and have my son stay up later so he sleeps later, it is an epic fail!!! When Baby #2 came, I thought I was prepared. I was armed with my “I am not going to do it like I did with Baby #1” sleep plan. Well, at 3 months, it is better but not perfect! This time, I have tried to get a routine/rhythm sooner. This is out of pure necessity of needing time to take care of my 3 year old and take care of life. The routine that I found most helpful is Tracy Hogg’s “The Baby Whisperer” EASY. E = eat, A = activity, S = sleep, Y = You Time! The hardest part: the YOU time since I am trying to be “super mom!” The best part — knowing the general flow of what to “expect” in terms of how long baby should be awake at certain ages. For example, at 3 months, Baby # 2 should be awake about 80 minutes before going back down for a nap and should nap about 3 or 4 times per day. All babies follow similar sleep stages: I should look for yawns, and have him all but in the co-sleeper by yawn #3!!! It doesn’t always work but it is better. Best advice: even at a young age, there is a “flow” (if baby is healthy medically). So, why this blog now? Because there was one bump in the road that blind-sided me and, it is coming up again! DAYLIGHT SAVINGS . . .November 4th . . . there is no stopping it. For those of you that have kiddos that can easily adjust, Yay for you and cheers to your extra hour of sleep. For those that have babies and little kiddos that still struggle with the change, the baby sleep site is always helpful to me. “Falling back” is the hardest because even if we are “sleeping in” until 5.30 – that means a crazy 4.30 wake time soon. Time to start preparing. More reviews of our preferred baby books/references is coming soon to this blog but I simply wanted to share my “real life” reflections and obsessions. I am still so amazed by my children and their development. I have a 3 month old who is just learning about himself and his world, that his smile makes mommy smile, that his voice makes sweet sounds too, and that he has hands and they are cool. I have a 3 year old whose hands are busy all day building, writing, coloring and who likes making things “dis-pear” by saying “abracadabra,” spending time in his pretend schools, forts, zoos, and oceans, and talking himself to sleep! I can imagine a time soon when both boys will be difficult to wake (like their daddy) and I will be Googling “ways to wake up your teenager.” Until then, I will keep traveling along this sleep road hoping that the gets easier. Even though I am sleep-deprived and sleep-obsessed, I am blessed! Sweet Dreams and Sweet Sleep for All!